The Extract must be used with Nisim NewHair Biofactors Shampoo. Best for dry scalp/hair. Our Tri Pack - an economical way to purchase Nisim products. You get a complete supply of all the products. 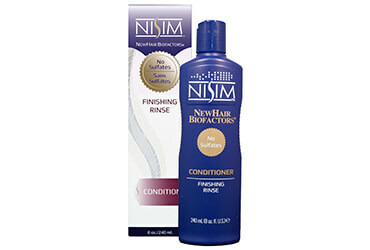 A thick creamy conditioner designed to work with Nisim shampoo and extract. 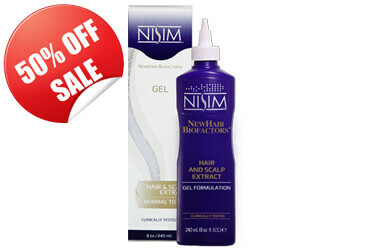 The Extract must be used with Nisim NewHair Biofactors Shampoo. Best for oily scalp/hair. The Tri Pack is an economical way to purchase Nisim products. You get a complete supply of all the products. 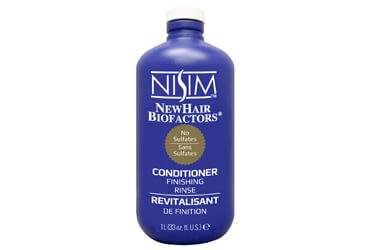 NEW Sulfate free Nisim NewHair Biofactors deep cleansing hair loss shampoo. For Normal to dry hair. 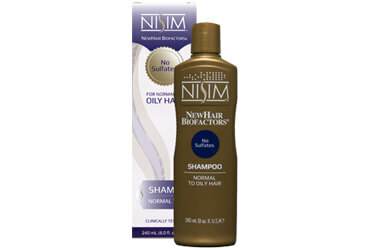 New Nisim NewHair Biofactors Normal to Oily hair loss shampoo with no sulfates, parabens and DEA. 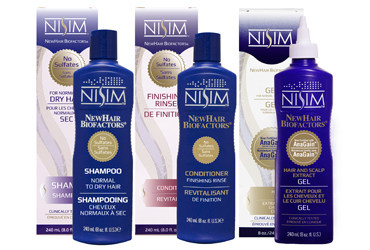 Nisim's products are all natural herbal based products developed using the proprietary extraction methods developed by Nisim with over 25 years of research on the study of healthy hair and scalp. It's backed with a 100% Money Back Guarantee -- if you do not receive the desired results within 7 days of continuous use, simply call in for a full refund. There is no time limit to request a refund → click here to view full details. 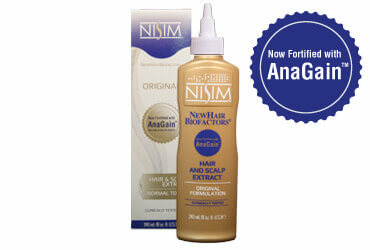 Nisim Hair and Scalp Extract is MASSAGED into the scalp twice a day. The Extract is a leave-in application. Nisim does not rely on chemical irritants that cause skin irritation for vasodilation. Natural vasodilation occurs when the product is massaged into the scalp. The Extracts must be used in conjunction with the NewHair Biofactors Shampoo, the extracts are not a stand alone product. When you have achieved the desired results (typically 18-24 months) you can discontinue the use of the Extract and maintain your healthy hair using only the Nisim Shampoo. This is not a product you have to use for the rest of your life. 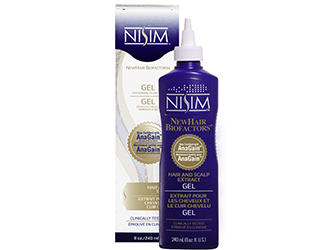 Nisim NewHair Biofactors Shampoo is the first step in controlling the build up of sweat, oils, and dirt, which all contribute to hair loss. All Nisim products ship from Coralville, Iowa, USA. Don't let your Shampoo block you to Better Hair. How does DHT play a factor in hair loss? Dihydrotestosterone (DHT) is a variable in male and female pattern baldness on the grounds that the DHT ties to receptors sites, for hair growth, on the scalp. When DHT ties itself to the hair follicles on the scalp, it interferes with the ordinary growth chain in hair development. Does not keeping your scalp clean add to Hair Loss? A clean scalp is important to stop sweat and excess sebum clogging the hair follicles causing hair loss. The deep cleansing scalp shampoo eliminates unwanted oils, sweat, dirt and excess sebum, as well as removing other factors that add to hair loss. This thereby creates a healthy scalp environment needed for natural hair growth. Is there a combo pack or a tripack that has all the product I need for hair restoration? Yes. If you need Normal to Dry please go here, if you need Normal to Oily please go here. If I am currently taking minoxidil, nioxin or propecia how do I switch to Nisim? To change from one product to the next you will need to slowly reduce the amount you use one product and increase the amount of Nisim you use each day. 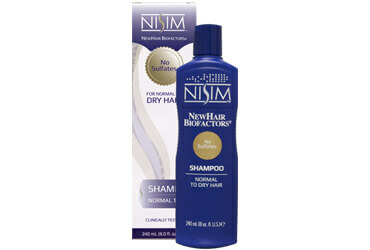 Try alternating days until you only shampoo with Nisim NewHair Biofactors Shampoo. I’m looking for Sulfate Free Versions of the Shampoo where can I find this? You can find the sulfate free Normal to Oily Shampoo here and the sulfate free Normal to Dry Shampoo here. 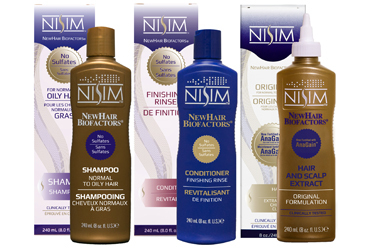 How does the Nisim® NewHair Biofactors Shampoo differ from competitive products? The shampoo can be used as a stand alone product and is formulated to begin working as early as a week. It is also one of the few shampoos in its category that has no sulfates. Yes, Nisim® shampoos has demonstrated being effective in controlling and diminishing minor scalp issues and problems such as itching, dandruff, etc. Our products have all been tested and are safe to use. It is best to consult with your doctor for advice regarding the use of any product during pregnancy if you are unsure. Will the shampoo help to control Hair Loss due to childbirth? Yes, it’s common to lose hair up to three months after childbirth. While hair loss during pregnancy is often temporary, using our shampoo will help keep hair under control postpartum. What is the difference between the Gel and the Original formula Extract? Both recipes of the concentrate have been detailed to work effectively. While you can utilize either extract, it is recommended that the Original recipe be utilized on all the more slick and oily hair and scalps and the Gel formula is best for individuals with drier hair and scalps. The Gel extract is easier to apply and contains some styling properties.